This artisan pizzeria which is quite famous in Canada is now here in Manila and already has two branches since it opened in April 2013 along Tomas Morato in Quezon City and the second branch at U.P. Town Center along Katipunan Avenue which opened in October. For being a newbie here in the country, Steveston is doing quite pretty good and the U.P. Town Center branch was quite full when we visited recently. 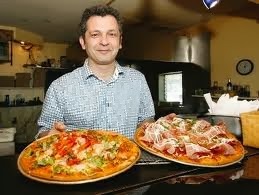 In a nutshell, Steveston Artisan Pizza originated from Richmond, Canada. Chef Nader Hatami who owns Steveston, created the $450 pizza, a very expensive pizza which is topped with a thermidor of lobster, black Alaskan cod, and a side of Russian osetra caviar. Brewed Iced Tea. Daughter gives this a two thumbs up. She's the expert on brewed iced teas. The Elements. Water, Earth, Wind, Fire. Although you can order a whole pizza with two flavor choices, we requested ours to include all the four elements so that we can try all of it. A word of caution though: The "Fire" element is not for the faint-hearted. Well, I chickened out upon seeing all those red chilis. But I bet its good because my foodie companion ate all of it. I love the "Water" element- the one with the shrimps and other seafood bits. By the way, the white ball in the middle is called bocchini cheese. Bocchini cheese are made from the milk of water buffaloes. They are milk in taste and very soft. Japanese Pizza. It has wasabe dressing aside from the nori and chicken toppings. I heard that this is one of Steveston's bestsellers. Thumbs up!